Subscribe Today and Save 50%! Discover Why the Field’s Top Experts Love the Networker . . .
Psychotherapy’s Most Popular Magazine Gives You . . . Check out our latest issues here! 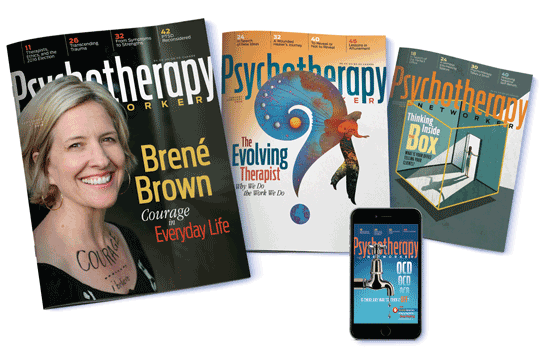 For more than 40 years, the award-winning Psychotherapy Networker magazine has been dedicated to helping you help your clients—and keeping you feeling creative and inspired. In every issue, you’ll find engaging, thought-provoking articles and practical therapeutic strategies to expand and sharpen your clinical skills. We gather together the world’s leading experts to offer you the latest research, current debates, and indispensable guidance for your most challenging cases, keeping you on the cutting edge of psychotherapy. Avoid information overload with a single publication that surveys all the latest practice trends, and even earn CE credit just for reading! Your first magazine CE is FREE (a $25 value)! 100% money-back guarantee. If you’re ever dissatisfied with the Networker, simply cancel your order and we’ll send you a refund for the remainder of your subscription.